South Lake Tahoe, Calif. –The U.S. Forest Service Lake Tahoe Basin Management Unit (LTBMU) plans to resume work on the South Shore Fuels Reduction and Healthy Forest Restoration Project in early May. The project authorizes thinning of trees and brush on National Forest System lands from Cascade Lake to the Nevada state line to reduce the risk of severe wildfire and create healthier forests. The first units scheduled for treatment this season serve as a backyard playground for many South Lake Tahoe residents. Units 20 and 1020 consist of 280 acres between Golden Bear Estate off Pioneer Trail and the Sierra Tract. Trees in Unit 20, the more upland unit, will be thinned and removed using whole tree yarding, in which the entire tree is cut and moved to the landing for processing. 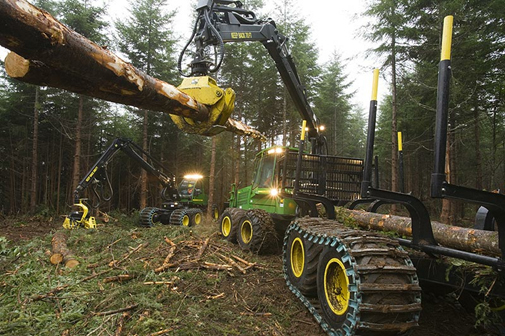 The treatment method for unit 1020, closer to the stream zone, will be cut-to-length thinning, in which trees are cut and processed on site by a harvester which removes limbs and brush and cuts the tree into lengths for transport. Possible alternatives for recreational access include National Forest lands south of the Golden Bear subdivision and the reopened Railroad Grade Trail east of Pioneer Trail. While the two treatment units are heavily criss-crossed with neighborhood trails, they have very few official roads and trails. After work is completed, the Forest Service will restore official trails but will not restore user-created trails. User-created trails may be covered with vegetation that has been ground up and left as surface cover to prevent erosion. As the field season progresses, mechanical thinning may occur in a number of other South Shore locations as conditions allow, including Christmas Valley, Fallen Leaf Lake, Meyers, the Hwy. 89 corridor, Gardner Mountain and the Pioneer Trail side of Trout Creek. In addition to mechanical operations, the Forest Service also expects crews to complete at least 300 acres of hand thinning, which will include urban lots and areas near Hawley Grade in Meyers. Early season work also will include removing log decks, slash and biomass from landings in units near Trout Creek and Fallen Leaf Campground and decommissioning them. For local residents who’ve been wondering what will become of the very large deck of logs near Camp Richardson Resort, Forest Service staff expect to eventually remove the pile, potentially later this year. As the project continues, the Forest Service advises that piles at landings will sit for periods of time until they can be burned or removed. Prescribed burning of piles created by the work can occur throughout the year, if weather, fuel moisture and other conditions are right. The most active time for prescribed burning will be fall and winter, when Forest Service crews likely will be burning some of the thinned materials from last year, including piles near Trout Creek. Although the Forest Service doesn’t consider treatments complete until the piles are burned, the piles don’t represent an increased fire risk compared to an area that hasn’t been treated. Piles may sit for a while until conditions are right to burn them. The Forest Service will post closure orders for mechanical work at http://www.fs.usda.gov/goto/ltbmu/ForestOrders and provide periodic updates as work moves to new areas. For general information on the South Shore project, visit http://www.fs.usda.gov/goto/ltbmu/SouthShoreFuelReduction.